Pune 4th November’17- Are you craving for mouth-watering delicacies from the North Indian frontier exceptional? Are you looking for a place that will not only offer great food, but also a stunning view? Level-12 is the place to be. Yes, Level 12 is reopened, so all the food connoisseurs get ready to dive into the breathtaking view with some finger licking food. From delectable kebab platters to enticing tossed Lobsters to lip-smacking curries to succulent paneer and the heritage biryanis, Level 12 offers a wide range of North Indian food which brings out exotic Indian flavours. In a lovely ambience that transits you from the hustle and bustle of a modern city to the city’s most chic and stylish area. 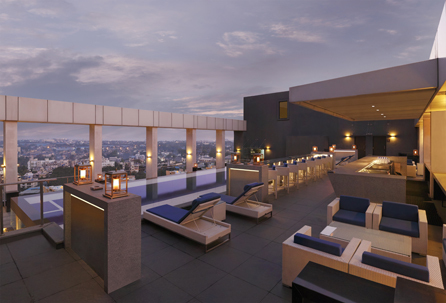 The Rooftop Resto Lounge presents a beautiful panoramic view of the city making it a favourite amongst those who love to sit in the moonlight while enjoying scrumptious North Indian cuisine. This high-energy Resto lounge is kept abuzz by the talented in-house DJ who plays upbeat jazz, funk, house, club and a unique twist on classic hits. Greeting you with soft lounge music and occasional jazz riff, the main bar area features cosy tables for two to four and pool-style bed seating that lends itself to a more informal outing. The bar seats and round tables make for a perfect area for conversations with the elegant community table near the DJ console creating a sumptuous atmosphere. The skilled Mixologist at the bar engages visitors with unique mixes, blends, shakes and stirs by muddling the best ingredients into veritable works of drinkable art. From unique cocktails like Vanilla Sky to The Hulk, to mesmerizing mocktails such as magical mojitos and mystical margaritas to infused vodkas and much more- get ready to sip on your favourite beverage and soak into an opulent reverie at the poolside bar at Level 12. The bar also hosts an extensive cigar menu to match your wide selection of Single Malts.